CBRE, one of the world’s leading commercial real estate developers, commissioned Explorer’s expert designers and cartographers to create colour-coded presentation maps of both Abu Dhabi and Dubai. These maps, which include main roads, waterways and airports, clearly display the locations, boundaries and names of the cities’ communities, allowing CBRE’s clients to easily identify their desired neighbourhood. 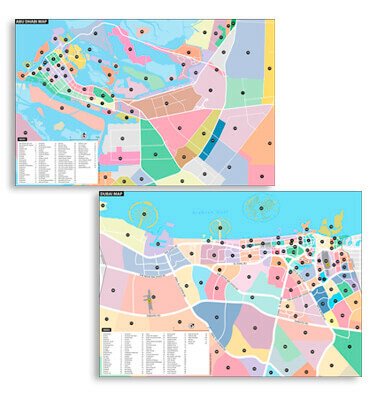 Delivered in a vector format, the maps can be seamlessly integrated into print or digital presentations.